Is this "Get Windows 10" icon legitimate? - Ask Leo! A suspicious-looking icon that invites you to Get Windows 10 - is it legit, and should you? Just noticed the icon prompting me to reserve my free upgrade to Windows 10 (currently running Windows 7 Pro SP1). Is it legit? If so, would you recommend jumping right on this, or waiting a few months while others get the bugs out? Whether you do it is up to you, but it’s not going to get you what you think. And somewhere, I swear, there’s a marketing “professional” that needs a good talking to. I got a flood of questions today about a “Get Windows 10” taskbar icon that appeared on many people’s machines. In many ways it “feels” like it could be malware. It shows up without notice, promises you something (for free, no less), and leverages current news – the impending release of Windows 10, whose release date just happened to be announced today. It is apparently quite legitimate. You won’t get Windows 10. Not yet, anyway. Click on the icon and a window will come up with the Windows 10 offer. You might think that accepting this offer means you would get Windows 10 right now. Read it carefully, and you’ll see that this simply reserves your copy of Windows 10 and authorizes it to be downloaded when Windows 10 is finally released, currently scheduled for the end of July. To the best of my knowledge, you’re reserving something that doesn’t need to be reserved. 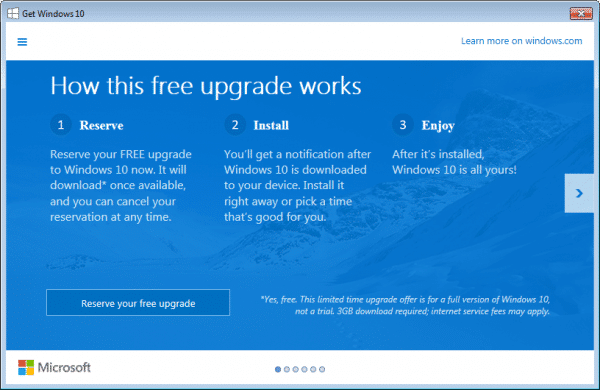 You can upgrade to Windows 10 after it’s released – for free – without “reserving” it beforehand. In my opinion, this is all just marketing. And not very good marketing at that, since it’s actually scared many people by acting like common malware. There’s nothing wrong with “reserving” Windows 10. It just means that on release day, it’ll start downloading. Note that it’s a three gigabyte download, so it’ll take some time. Once downloaded, you can install it. Once installed, you’re running Windows 10. For free. All “reserving” seems to do is request that the download begin when Windows 10 is released, automatically, without further interaction on your part. But I’m not sure I’d reserve it just yet. Should you get Windows 10? Getting Windows 10 is a bigger question. To begin with, I generally recommend waiting a couple of months after release anyway, so that more of the bugs and issues have been identified and worked out by its release “into the wild”. Anything as complex as an operating system of this magnitude will have issues that are only uncovered after release. So, I wouldn’t be in a rush. And to be clear, this means that, no, I would not “reserve” my copy today. If you’re running Windows 7 or 8, and you’re content, I’d wait even longer. I’d wait until it’s convenient, though I would upgrade before the free offer is discontinued. At this writing, that’s something like a year away. Once again, no rush. If you’re running Windows XP or Vista, and your machine is capable of running Windows 10, then I’d probably recommend you upgrade – again, though, not until a couple of months or so after the official release. Regardless of what you choose – reserve Windows 10 now or get it later – I strongly recommend that you take a complete system image backup prior to installing the new version. As I said, some issues are bound to remain. If one of those issues happens to affect you, then restoring to the backup you took immediately prior to the update can save untold amounts of grief. You may be be VERY glad you did. Chomping at the bit for Windows 10 - In anticipation of Windows 10 people are falling into three camps: never-ever, patiently waiting, and OMG!!!!. I have some advice for the OMG! crowd. How Do I Cancel My Windows 10 Update? - Many people are having second thoughts about accepting the offer to reserve their Windows 10 update. I'll show you how to cancel the reservation. « Previous post: Change for the Sake of Change? Hi. Leo, I hope this makes it through your spam filter. Thank you very much for your answer to my Q about Windows 10. As usual ( you have been good enough to answer a few things for me over the years ) your answer is to the point and very helpful. Another reason not to click on this. I have a computer which came with Windows 7. I upgraded it to Windows 8. If I upgrade from Windows 8, I’ll lose my Windows 8 upgrade license. So when I decide to upgrade to 10, I’ll restore my factory Win 7 and then upgrade. That way, I won’t lose my Window 8 license. Several months ago I read that the “free upgrade” to Windows 10 would last only one year. Thereafter, I’d have to pay an annual licensing fee. Is that true? Not a problem…….The opportunity is available for one year;……the free upgrade is permanent; no cost, perpetual, forever, etc. Your advice about waiting to upgrade to Windows 10, is good advice. Unfortunately I have already reserved my upgrade, before I read your article. I also reserved Windows 10. After reading Leo’s article I’ve decided not to install it. From what I understand, the download is automatic but not the install. I am going to delete the download rather than just not installing it so that if there are changes, bug fixes, etc., I can get a clean copy. You should be safe as long as you don’t hit the install button on the pop-up when the download finishes. As others have commented, Windows 10 will NOT automatically install. You can choose to not install it. However, if you want to eliminate the bandwidth usage for the ~3GB download, you can cancel your reservation and it will not automatically download. Microsoft will merely download your copy of Windows 10. You get to decide when to perform the actual installation. I plan to wait awhile, myself. Richard: The fact that you “reserved” Windows 10 does not mean you have to install it. Reserving it just means the FILE will be automatically downloaded to your computer. Having the FILE doesn’t switch you to Win 10; you have to RUN the (executable) file to install it. If you don’t run it (answer ‘No’ to do you want to install), it will not install and you will still have Win 7 or whatever is your current OS. You can leave the file in your Download folder for as long as you like, and decide later whether to install it or delete it. Good advice all round about waiting and backup. My problem running W7 SP1 is that particularly browsing using Firefox and to a lesset extent Chrome seems to be getting slower and slower. I am wondering if this a RAM issue and if W10 will permit more RAM to be installed in the machine currently limited to 2GB by the OS. I also run W7 SP1. I’ve got 3 gig of ram installed and it uses it. I’m also having chrome run more slowly and I believe it is due to limited ram and swapping. Chrome has added many features (apps & extensions) over the years and it all consumes ram. I’ve been thinking about upgrading to 4 gig and your question surprised me enough to do some research. Unless you are running W7 starter you won’t have a problem. Here is the official Windows 7 ram guide. You can paste this in your browser or right click and select the go to. You may want to try removing those Chrome extensions… you might not need them and could get your speed back. Stephen: Unless you’re an EXTREMELY patient person — one who doesn’t care how long his computer takes to do things — you should not use any OS beyond XP on a machine limited to 2GB RAM. Win 7 is a memory hog relative to its predecessors/does not run well with <4GB. I discovered this only because I provide computer tech support to several families. One of them had an old Dell Dimension 2400 that came with XP and is limited to 2GB RAM. A year or so before I started helping them, they were panicked by Microsoft's "warnings" that XP would no longer be supported, so upgraded to Win 7. The computer became a slug, and about 4 months ago, they had me deliver it to a guy who recycles computers for disadvantaged kids. In effect, they paid $100+ for an OS that ruined the efficiency of the machine. Windows 8.1 runs fine with 2 GB of memory. I have 3 machines that are all converted from XP to Win 7 SP1 and each one runs much better. Disregard Don T’s poor advice. Hogwash…..We are running 16 Win-7 … Win-8.1 machines on 2Gb with no slow downs at all. As a matter of fact, our performance is improved from the XP experience on the same machines. Your slowdown problems are due to ill advised applications; bad anti-virus software choices probably. I installed Win 7 on an 8 year old Asus 100h eee Netbook (originally XP) 2GB RAM. It runs fine. My computer is about 10 years old with a P4 2.4 GHz CPU (before hyperthreading was introduced) and 2 Gb of RAM. If it supported 3 Gb, then Windows 7 would have automaticaly accounted for that. If it had more RAM, then, I would have been able to use up to 3.5 Gb with NO action from my part. It works beter than it did under Windows XP SP3. If your computer is realy limited to 2 Gb, it’s a hardware or frimware isue: the address buss may be only 31 bits whide, or it may be limited by the BIOS. In this case, there is no way that the OS, any OS at all, may extend that limit. I have Win 7 with 512 megabytes memory. Works very well (albeit not very slowly). I have a Dimension 2350, same family, that won’t even deal with RAM above 1.5 GB, the only problem I know of having personally is that I don’t think I have a single computer (of at least FIVE) that has the UEFI? type BIOS or any other hardware based security features required for Windows 8. If you can’t run 8, AFAIK you cannot use 10. It’s my opinion that after 34 years of PC history people now look on computers like they do cars and are tired of buying a new ‘car’ every two years. It doesn’t matter whether it’s good or bad anymore, computers are now appliances like toasters and TVs. There’s nothing magic about them to most people now. If you need food or clothes an OS or computer is of no consequence, the ‘real needs’ will be met first. So the ‘computer revolution’ is misfiring on a couple cylinders of late. And yet people are willing to buy a new car every two years, or every five years. And deal with the changes as well. The parallels with the automotive industry are actually quite stunning, as long as you compress the timescale – Computer technology moves faster than steel technology. 1) ‘Web browsers’ use a cache to keep the latest web pages on your PC. Firefox sets a default value that I think is much too high for a broadband connection; reset it to about 15MB. Chrome doesn’t seem to allow you to set the size – it just keeps growing. Get rid of Chrome until they fix that issue. Neither your Firefox or Chrome issues are DIRECTLY related to the system’s RAM size. 2) Not sure I understand what you mean by “…W10 will permit more RAM to be installed in the machine currently limited to 2GB by the OS”. unless you’re using W7 Home; which does limit machine RAM usage to 2GB. That is, even if you’ve got 4GB RAM, W7 home will still only use 2GB. That limitation is ‘built in’ to W7 Home, which was provided to ‘third world’ markets only; I don’t believe W10 will introduce that limit. HOWEVER, if the PC is limited to 2GB, WIN10 won’t fix that! I have reset the cache limit in Firefox to 15GB as you suggest and we will see how it goes. My machine has 2GB ram installed – as far as I know the board will accommodate larger units but I understood that there was an overall limit with W7 (I have W7 Home Premium with SP1) of 4GB and that the video card grabbed 2GB leaving any larger amount of installed RAM useless. Perhaps I have misunderstood all this. I would be very happy to buy some 2 x 2GB RAM units as long as the additional capacity would be available. If your machine is 64bit capable, then that limit isn’t quite true. If your machine is only 32 bit, or you have a 32 bit OS installed, then a) the max RAM is 4GB, and b) your video card may make some of that inaccessible. HOWEVER 2GB seems WAY WAY WAY overkill for most video cards. Normally we’re talking a few hundred megabytes at most. According to Microsoft’s reservation window, we’ll be notified after Windows 10 downloads and you can choose when it is installed. You’ll also have the opportunity to cancel your reservation and to download a single copy you can install on all the computers on your network. It’s still a bit fuzzy now and no doubt clear details will emerge later. What’s particularly irritating, however, is that after you’ve reserved your copy of Windows 10, that darn icon does not disappear. Hopefully customizing the Get Windows Icon to show only notifications will get it off for now. The icon is there for you to change options as well as to remind you that it’s available, it’s shouldn’t go away until the download is either done or cancelled. Think of it as tying a digital string on your finger. PS I’m not the original commenter named Steven in this thread and should change my name slightly to reflect this. The earlier posts today made by Steven are me too. After reading the article, I decided that maybe I had reserved Windows 10 a bit too early. So, to cancel a reservation, Windows says to rt. click on the icon in your computer’s task bar, then click on “check upgrade status”, then click on “cancel reservation”. However, when I check upgrade status, there is no “cancel reservation”. What now? After some trial and error, I discovered that there’s one more step: after you right click on the task bar icon and see the confirmation page, click on the list icon in the upper left corner, then on ‘View Confirmation’ in the list it provides. This will give you a new window which has the ‘Cancel Reservation’ link visible. Clicking on that link will give you yet another window with a desperate sounding, lame attempt to get you to change your mind by claiming incredulity that you’d risk missing out on the free upgrade by canceling. As if you might not be able to find the download link ever again, in spite of the year-long, non-stop media and advertising blitz on the way. Click on the ‘Cancel Reservation’ link and you’ll get *another* chance to change your mind. Gag me with a gigabyte . Incidentally, the new taskbar icon will still be there when you cancel. And by the way, I’m not a Microsoft hater – I’ve been using their products since the beginning. But behavior like this just sets me off. You can turn off the icon and notifications in Taskbar Properties: rt click an empty spot on the task bar; click Properties; in the Notification area click the ‘Customize…’ button; find the new white Windows icon (labeled GWX) and select your preferences. Or you could just click on the little white arrow to the left of your notifications and then click “Customize.” It’s a lot easier than driving around the block to visit your neighbor. This action doesn’t really “turn off” the GWX notification, it just hides it. Correction. >sigh< That doesn't remove it, just 'hides' it. Looks like it's here to stay. thanks. For the moment it works for me. We’ll see what happens next. I have a motley crew of computers to upgrade. All are upgraded from earlier versions (2 with roots in v3, 2 from ’95, 1 from ’98 and lastly one from Vista). Currently running various flavors of Win7 (32/64 Home/Pro) and one Win8.1. Will there be an ISO alternative – so I do not have 20GB download? We’ll definitely need to wait and see about that. In other versions of Windows, the gave an option to download an installable version. Of course, MS never gave an OS away before, so who knows what else they’ll do differently. I hope so, I’m in the same boat. But once again it’s simply too soon to say. I’m running Windows 7 on a 1GB ram memory Toshiba and it’s just about adequate, no more. I imagine Windows 10 might need at least 2GB to run efficiently. Your thoughts, Leo, much appreciated as always. My guess the requirements will be about the same. They claim (https://www.microsoft.com/en-us/windows/windows-10-specifications) 1gig of RAM, but I agree I wouldn’t go for less than 2. I have a dual-boot system, Win7 Pro on one side, Win8.1 Home on the other. Is the upgrade of a corresponding version (If you have Pro now, do you get Pro in the upgrade?). This will likely influence how I accept the upgrade, once I finally take the plunge… For now, it ain’t broke so I ain’t gonna fix it. I attended a presentation by Microsoft, and yes, Pro => Pro, Enterprise => Enterprise. They really want to get everybody running the same version, which will reduce support costs. I don’t have the icon — I feel SO left out! I didn’t even have an opportunity to panic! My guess is to WHY they’re doing this: so that they can say “On day 1, X-bazzili-thousand people downloaded Windows 10!” to “prove” how popular it is. But indeed, I’ll be waiting a couple of months, just for the reason you suggest. Hello Leo, I read that win10 is a free upgrade for win7 and win8 BUT only for one year. After the year is up we must purchase win10? It will only be available to download and activate for free for one year, but if you install it and activate it within that year, your license should be good for the life of the computer. One of the things that scares me about anything new from Microsoft is that they’re often careless about simple things or put flatly false information on their Web site. One example is the page of FAQs about Windows 10. One of the questions is “If I change my mind, can I cancel my reservation?” When you click on it, it tells you to right-click the reservation icon, pick “Check upgrade status”, then select “Cancel”. Only one weeeeeee problem: there is no “Cancel” button on the window that pops up. So as of right now, you cannot cancel a reservation. Gives one great confidence that Win 10 is not going to be another Vista, doesn’t it? Don – See my answer to William Sowers, above. Was the omission intentional, to discourage people from canceling, or was it a mistake? More to the point, does it matter? This morning I discovered how to cancel a reservation. It is NOT the way M$ explained it on the FAQ page. Right-click the Win 10 icon in your systray. Then click the “settings” icon in the top left corner of the pop-up (looks like 3 short, thick horizontal lines). Click “View Confirmation”, then click “Cancel Reservation”. I want to reserve this on all my machines. FIRST, for those who don’t have the icon – do a WINDOWS UPDATE, to get all the latest updates. Apparently this icon was in that bunch of updates. INSTALL is not a requirement, but this way you start to get the download when available. MY ONE QUESTION is if the 3 gig file can be put onto a DVD or USB stick to install from so that I’d need only one download. I currently use PARAGON HARD DISK manager – it is GREAT for image backupsw, and has excellent PC Magazine reviews. keep that drive in place with the new system and keep prior drive with the old system…. I personally am excited to try windows 10, from all I’ve read about it. BUT, as LEO says, CAUTION and CONSERVATIVE methods are the best. I have 4 machines. One will get windows 10 immediately (a lesser used machine) to test this out. If it works OK, then slowly upgrade the other machines. Again, good luck to all, but take time NOW to PLAN what you intend to do. As leo stated, you have a 1 year window to get the software, and install, for free; (and running that version is free beyond the 1 year period). If you install it AFTGER the 1 year, therr is a charge to buy it. Thanks for the info. I always enjoy reading your blog. On a daily basis I receive a ton of emails and I delete most of them. Yours is probably one of the few that I take time to read. Quite informative and practical. Thanks again. If you can’t find programs which do the things you need to do, you can find websites with recommendations for the best free applications, where from my experience, you can find free programs which can do almost anything that can be done on a computer. http://ninite.com is also great. They have close to 100 of the most popular free programs listed where you can check the box, and the programs are all automatically installed using their downloader program. Or you can specify your need and ask for recommendations here from Ask Leo! readers. I’m still using 15 year old programs like Word Perfect on my installations of 7 and my antivirus and malware programs still work with XP. Do I appreciate 7? Tremendously, but the fear mongering was ridiculous, much like the Y2K bug. I saw that installing Win 10 will invalidate your current Windows so it may be possible for upgrade rather than clean install being available. Whenever you upgrade to a new OS the license for the operating system which is on your system is invalidated otherwise, it wouldn’t be an upgrade license. For that reason, when I upgrade, I plan to restore my system to the factory version of Windows 7 using the recovery discs I created. That way I’ll still be able to keep my purchased Windows 8 license. Not really sure that I’ll need it, but it might come in handy to upgrade an XP machine or something. My thanks to Don T, for answering my question. Well, in my case yesterday I went to my Notifications or Systems Tray and chose the “Hide this icon and notification” option. Then today when I went to Windows Updates, I noticed an option to “Reserve” Windows 10 but clicked on the “Learn More” link instead. The FAQs seem to contradict one another in that it seemed I’d lose that chance to reserve Windows 10 if not done by July 29, 2015. But in the next FAQ it said I had a whole year to do the install if I so choose to do so. I told my daughter’s mom who also has a Windows 7 computer that I’d wait 6 months for the bugs to clear out first then download Windows 10. I had hope to clear the message out of Windows Updates and clicked the reserve button thinking there would be an option to wait or decline, but it just put me on the reserved list. So I immediately went to my installed updates and uninstalled “KB3035583”. After my computer did a required restart all was gone so I cleared the Windows 10 notification from my system tray with a “Clear Notifications App” and went to my AppData and deleted the “GWX” Folder. Windows Updates immediately offered me the Windows 10 Update “KB3035583” again but this time I hid the update. I will install Windows 10 on my Windows 7 laptop but not my Windows 7 desktop because 10 eliminates “Windows Media Center”. I specifically customized my order from HP to INCLUDE “Windows Media Center” and will not give that up. To clarify I did all the above things on my Windows 7 “desktop” computer and yes “Windows Media Center” comes with Windows 7 without a special order. What I meant was I ordered a video card to record from television similar to TiVo and don’t won’t to lose my ability to use WMC. Do you know if there’ll be an “offline” way to get win10? for those of us without broadband [yes, there are still some of us so-screwed out in the wild] a 3 gig download will take *weeks*. I’d need to take my tablet and find someplace I can “borrow” broadband [for quite a while, alas]. even better if I could buy a DVD with it. Currently running win7pro/64 and very happy with it, so I’m in no rush. I hope so, since I’m in a similar situation (data caps and multiple machines). However it’s too soon to say. About your problem for multiple machines, I think you can download it once and copy it (with an usb stick, cd, etc) to your other computers. This was mentioned somewhat in an earlier comment….will we be able to download the Win10 update/OS and burn it to a DVD or put it on a flash drive? On my home desktop computer we only get 5 gigabytes a month data (Verizon Hot Spot), so 3 gig would almost wipe us out for that month. I have a laptop that I can take to the local library and download Win 10, but if I could put it on a flash drive or burn it to a DVD then I could use that to put Win 10 on my home desktop. Perhaps Leo can answer this question. I also have dial up as an emergency backup to the net but as someone else mentioned, that could take a very long time to download 3 gigs. It’s too soon to tell. I hope so. If the download is an executable (.exe) then you should certainly be able to burn it to a DVD or copy it to a flash drive. Also, you should be able to download it at the library (if it’s allowed there – talk to the librarian) and copy it to DVD or flash to avoid using the bandwidth at home. Is this free windows 10 upgrade available for UK users? I am in the UK running W7 SP1 and I have the W10 taskbar icon offering a free upgrade, so ‘yes’ it is available to UK users. Having read all of the above though I have ‘unreserved’ my free upgrade. I too would like to be able to create installation media (DVD) so my system can be reloaded if my backup images (original and incremental) fail in the event of a hard drive failure. I guess it’s clear from this response that I have been trying to follow Leo’s advice for a while!!! I have not received the Get Windows 10 icon. Why not?? How can I check out my computer is compatible with Windows 10. You should have had it automatically last month with the MS mid-monthly update, it would have been KB3035583. KB3035583 would have arrived in your MS mid-month update last month or April and installed automatically, you can search on the internet to see how to get rid of it. From what I read elsewhere, it could mean your computer is not ready for the update. One of the reasons given is that automatic updates are turned off. Another is that one or more of your drivers/programs haven’t been updated to Win 10 specs. The article also mentioned that the icon didn’t appear for many people, but no one has any real idea why (such is my case – not that I miss it). The best guess is that the readiness checker found something it didn’t like, but won’t tell you what it is. I read that it was presented as an optional “recommended” part of the update, so if you didn’t select it, you didn’t get it. Just to state the obvious, if you reserve / download Windows 10 when it is first released but do not install it for a few months as Leo suggests, when you do install it you will still be installing the first release (probably with many bugs), not any updated versions that may come later. So you need to wait a few months before downloading & installing to get the most benefit if Microsoft issue an improved version. Like any other OS. You first get the latest release, then spend a lot of time getting the updates. What Leo suggests is to wait until the major “initial problems” get addressed before you download and install any OS. Although the download/install takes a bit longer (due to the updates), at least a person can avoid the usual initial problems associated with any new release. Actually this is good advice for any software. Wait until enough people complain about the “undocumented features” to get them fixed, then install the software plus all the updates. Presumably if you delay the install you’ll then immediately get all the subsequent updates via Windows Update. – the icon cannot be removed from the system tray (= the most important option is missing). Leo, you are absolutely right. This is a bad idea from someone in marketing who needs to get his thoughts corrected. Indeed, good article. Though I’m in a little disagreement – what he calls a “targeted advertisement”, which indeed it is, should not have been delivered via an “important update” in Windows Update. When it starts delivering advertising it reduces people’s trust in the update mechanism. I think all this is a load of twaddle, at best, this is Microsoft just attempting to get everyone to utilise touchscreen technology which is what WIN 10 is initially for, for those of us who have PCs and laptops this isn’t any different from WIN 7 or 8 in essence, it’s all Marketing gump from Microsoft to get people to spend more money on their products in the future, why should we all be surprised with that. WINDOWS 7 has technical support until the year 2020, why bother to change, I’m hardly likely to be getting a touchscreen monitor to play games on and surf the ‘net whilst I’m sat in the office!!!!! People made the same complaint about Windows 8, and it wasn’t true then and it’s not true now: Windows 10 (and 8) are not an attempt to get people to use touchscreen. Will the upgrade be a download that can be saved for future install or is this a mandatory install ?. If it’s a download I can save I can then install it exactly when I want to and after backing up my machine. If it just installs itself I do not want this just yet. It’s not “mandatory”, as you can still say no when it asks to “install now?”. There’s no data available yet that indicates whether it can be saved offline or not. Honestly I would wait until you’re ready, and then a) backup, b) download and c) install at that time. First of all Thanks to “Leo for address this hot topic” The White icon(GWX=Get wind’s 10) get displayed on my PC-Since June-01-2015. I’m kind of scary ’cause although the “W10-OS” it has cool features,like the actual return of the START menu & able to snap up ’till 4wind’s–They say nothing about the built-in New Browser,called I’m ok with IEplorer-11. The use of the word “reserve” is definitely confusing, since it implies that there’s some sort of supply that’s going to run out, but it appears that this actually allows it to download Windows 10 ahead of time so it’s ready to install on the release date. From the confirmation email I got today from Microsoft: “Because you’ve reserved, Windows will automatically take care of the download in advance. Then you’ll get a notification when your upgrade is ready to install. That way you can start using Windows 10 immediately – or schedule a time to install that’s convenient for you.” Paul Thurrott also describes it at https://www.thurrott.com/windows/windows-10/3909/ask-paul-why-do-you-need-to-reserve-the-windows-10-upgrade . There is one “good thing” to come out of the reservation scheme that, otherwise, has most IT/Tech people scratching their heads and fielding emails, texts, calls, and tweets I suppose, also. That good thing is a head count, what they can expect their servers to serve up on the 29th. I’m with you on the wait-n-see. Of course, on my laptop that’s serving up the Technical Preview, I’ll let that one go live ASAP! Linux distro’s can be bought from those that have fast downloads. They cannot charge for the distro of course, but do charge a small fee for copy and disc. Seems to be an opportunity for someone to help those of us with slow internet, Actually I would perfer to download from a disc rather than on the internet. Discs seldom stop or hiccup in the middle of installation. How about it? Is there a reason this cannot be done., probably so from Microsoft I would imagine. Read through all of the Windows 10 Q & A offered at “Get to know Windows 10”. I think you will be impressed and motivated to conduct further investigation of trial version testing performed during the past months. Windows into the future. I have read everything I can find from Microsoft, perused all the AskLeo! comments. My conclusion: The taskbar icon / “reserve” issue is pure bunk. There is no “reserve”. There is no reason to rush. There is no reason whatsoever to respond to the notification and “reserve” your copy. It is 100% manipulative, promotional bunk. Microsoft wants to push everyone, apparently by any means at their disposal, into switching as quickly as possible. And they are leaving a sloppy, confusing trail of mis- and dis- information in the process. The update will be available free for a year after its release in July. Like many have said, just wait until the bugs have been worked out – I’m giving it 8-10 months – and then download the latest version. And kudos to Leo for saying it right off: “And somewhere, I swear, there’s a marketing “professional” that needs a good talking to.” I would not have been so kind. As always great commentary that has been thought through & then well presented. I think Robert Moore has the right idea. Microsoft can use the number of reservations to determine the server load. It also gives them a chance to spread the load over the whole day based on the user’s location. The term “reserve” is primarily a marketing term that means “priority pre-order”. It is used for books, movies, games, CDs, tickets and such. The “reserved” copies go out first, then the rest is available for those who did not reserve a copy (not necessarily implying they would run out). It’s sort of like a restaurant; those with reservations go in right away, while those without reservations have to wait for an empty table. Those who reserve an upgrade to Win 10 will receive it automatically as soon as it is available, and they are online. Those who don’t could encounter “server busy, try again later”. Personally, I’m like Leo – I’ll wait until most of the initial bugs have been worked out. I’m happy with Win 8.x – using a standard keyboard/mouse configuration – and not anxious to go back to something resembling Win 7. I can understand the confusion and all the negative comments about Windows 10. I’ve been a computer professional since the days of the VAX 11/780, over 40 years. I always read Leo’s newsletter to keep abreast of the issues my clients may be facing. The comments provide a lot of insight into what people are thinking. Microsoft deserves the mistrust due to all the missteps in their past, however, I firmly believe they want to make the best product they can. They really do test their software extensively before releasing it. I have been “beta” testing Windows 10 for over six months and I couldn’t be happier with the latest build, but I realize I’m using something that is not ready for prime time. I am going to get the RTM Windows 10 as soon as it is available. I’m not recommending my clients do the same with their business computers. A slow approach is much better than having your business down because of undetected issues. The fact is that there are an almost unlimited number of computer configurations in the world and all the testing, while necessary, can’t provide a guaranty that nothing will go wrong. Patience and adhering to the tried and true procedures that Leo recommends are definitely the way to go. Yes, I like everything you, “Leo” wrote on the win 10 deal, except,, you said the reserved win 10 will be downloaded as soon as released, ( or something to that effect,,, ) My take is that even if i reserve win 10, i will have control of downloading it, or not getting it. Further my take on the rush to get Reserved win 10s is mostly to see what the interest will be, they may get swamped or like you, “Leo”, say, and I agree people will wait 6 months to a year before commiting to the new masterpiece win 10. Once you reserve it the download will happen automatically as I understand it. The install, however, is something you will be asked to OK.
Leo, I have 4 gig’s of ram on my 64 bit Windows 7, but here is my worry. I only have a 1 gig processor. I’m going back a long time ago in what I have learned. What ever Microsoft gives you as a minimum, you double. They do not know what you have on your machine, or going to be adding over time. In your opinion, what is the lowest you would ever go on a processor when they say this. I’m afraid to put Windows 10 on mine. Thank you…. If Windows 7 is running acceptably on your system I’d expect 8 and/or 10 to run as well. I agree, I always double the RAM and HD minimums – processor gets a little sketchier, which is why I drop back to how things are working for you today. Has anyone tried to unregister yet I have and you can’t. When I try to unregister you get a very fast flash of a box with two green check marks in the two boxes. If you are really ready you can you can click on the pop up but that only brings you to a box that reads: Great, your update is reserved. That is it, that’s all I got. Has anyone tried to un-reserve their download? If so where you successful in doing so. Yes, I went through the same process as you to unregister my “reservation” and it looked OK. Now, after a restart of my PC, when I look at Windows Update, it asks if I want to “reserve” my free upgrade of Windows 10 again. Hi.Leo, I just want to ask you something, do you know the deadline of ordering Windows 10 because I want to upgade my hardware and in the next week I will be having a new motherboard with a totally different socket. The deadline is a year from the release of Win 10. Approximately the end of July 2016. My laptops (office,home) and home desktop are running Vista. They won’t get free Win 10. Would it be worth getting a legitimate Win 7 upgrade or full version so as to be able to get a Win 10 for free, or is it likely that there will be a reasonably priced upgrade to Win 10? I have tried many times following recommended solutions to update my win7 (home premium win 7) machine to the SP1 update- but it always fails with a variety of error codes. Shall I be able to update to Win 10 in view of the microsoft SP1 requirement? Well, I suppose that’s what old Schwinns and Chevys are for. At least I’ve never met a car radio I couldn’t set the presets on. I won’t take up the free upgrade offer so I have disabled the KB3035583 update from Windows Update. Similar updates like KB2952664 are also disabled. I know that Windows 10 will not come with WMC but will it come with WMP? Thanks for all your help in the past! You have suggested system backup, i have not done this before. Could you please tell me how to do it? Thanks! Please use the search box above to search for backups, how to backup and image backups and more. 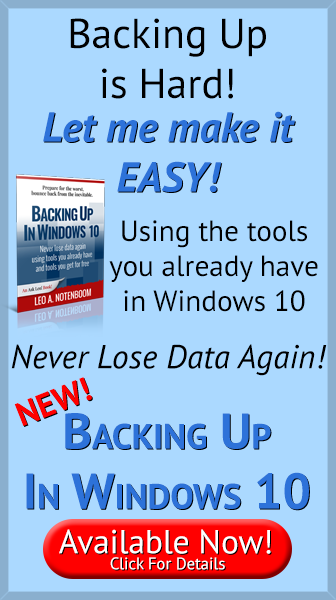 I have dozens – perhaps over 100 – articles on backing up. So We Understand from the article that it Will ”Get Windows 10” icon Upgrade the computer automatically to Windows 10 even i didn’t open it or open Windows Update? No. The upgrade should happen only if you request it. I have read all the comments about Windows 10, but cannot find a solution to my problem. Like most, I got the W 10 upgrade reservation notice and did not opt to get my upgrade. I uninstalled Windows Update KB3035586 and hid the notice for further notices. My problem now is that Windows Updates downloads an “Important” Update called “Upgrade to Windows 10. It then fails on the installation causing it to keep downloading it, causing constant usage of my limited bandwidth for the internet. Can anyone help to stop this monster?